OSM. Halloween 2015. Maison Symphonique. Photo Jennifer Guillet. 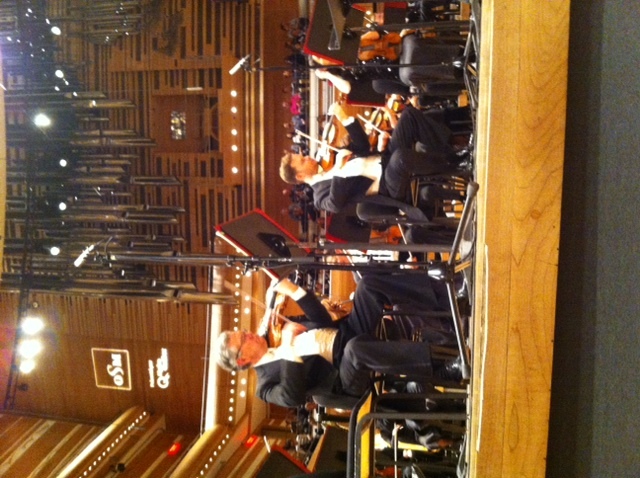 On October 29th, I was lucky enough to be able to go to a special concert held at la Maison Symphonique of Montreal. The OSM (Montreal Symphonic Orchestra) had a celebration planned for Halloween with all sorts of treats. The cherry on top of it all: Kent Nagano as guest conductor. OSM. Halloween 2015. Photo Jennifer Guillet. First of all, the Maison Symphonique is an architectural diamond. I could not believe the design inside the concert room : wood everywhere, large space, comfortable seats… an example of modern comfort and beauty. I was further astonished by the organ of the OSM. What a beautiful instrument. It seems to be floating in the air, waiting for the crowd to enter to let is music fill the room. Everywhere I looked, I could see beauty. I never expected the Maison Symphonique to be so beautiful. Secondly, I have to state that the sound was absolutely amazing. Believe me, when you are a singer, that is saying something (we are severe judges when it comes to sound). The hall was created to have an optimal sound, but I was not expecting it to be that good. Not too loud, not too low. Just the perfect amount of sound, anywhere you are in the room. Quite an achievement. When it comes to music, and that is my third point, everything was perfect, once again. The music choice was a great mixture of classical pieces, and more modern one like movie soundtracks. Every piece had been chosen to fit the theme of the evening: Halloween. The first part of the concert was dedicated to more traditional pieces, the second one to movie music. I was very surprised by the song choice. I never expected to hear the Harry Potter theme (Hedwig’s theme) at the Maison Symphonic, nor did I expect “I put a spell on you” from the movie Hocus Pocus (which by the way is one of my childhood faves, so it made me smile so very much). It is so surprising to see an orchestra perform those pieces. But when the orchestra is led by such a grand conductor in such a beautiful decor, the surprise turns into astonishment. Honestly I could not believe my ears that night. Amazing, really. As if it was not surprising enough, you have to add to all this a singer and host dressed as Dracula. Between the pieces, Marc Hervieux/Dracula was letting us know a little more about Halloween and told us frightening stories. But the most incredible part was when he came back on stage dressed as a Ghostbusters character, and ready to sing the famous Ghostbusters song, Who You Gonna Call? And we were invited to sing along. I mean, come on, don’t we have a winner for craziest and most surprising night ever? I honestly never expected any of this at a symphonic concert. And to think I was afraid (a little) to be bored. How wrong I was! I shall never forget the evening with the OSM for as long as I live. And If I had only one thing to add it would be this. Sometimes it is good to expect the unexpected, to leave fears of boredom behind, and to be open to new experiences. I strongly advise you get a ticket for next year’s show and go get yourself a special Halloween treat with no sugar, but the same rush ! Thank you OSM, what a perfect night that was.